In 1993 Sam & Chris established Ludbrook House Fine Foods. Determined to celebrate the abundance of fruit grown at Ludbrook House and in Northland they set up a commercial kitchen on site and began to market their new venture. Inspired by the over one century old fig and lemon trees still growing at the site of the original Ludbrook family home, the first product developed was Ludbrook House Dessert Figs. The recipe, given to Chris by her aunt, proved a real winner by being awarded the 2009 Cuisine Artisan award. 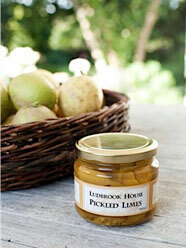 A further award followed in 2011 for Ludbrook House Pickled Limes. copyright © Ludbrook House: All rights reserved.